Spectacular 5 Pound GEMMY Madagascar. 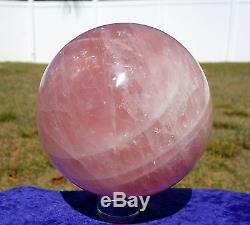 Super Luscious Deep Pink Crystal Sphere Ball. 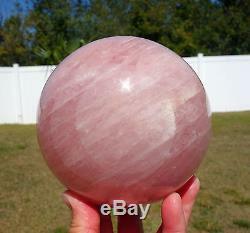 This lovely is an incredible pink color and is one of the gemmiest spheres in rose quartz we have ever seen! 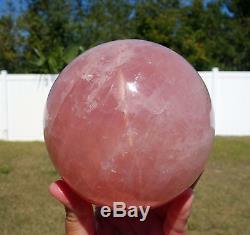 HUGE size at 4 1/2 inches, 5 whole pounds of incredible rose quartz of the finest! 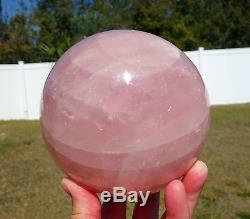 It has the coolest, most shimmery appearance we've ever seen in a Rose Quartz sphere! Very Vivid Rare Six ray star , elusive of the camera lens but it's definitely there! When you hold it you can easily see it and it just beams with energy! One of the finest we have ever seen! You can also see the radiance and luminescence in the photos. 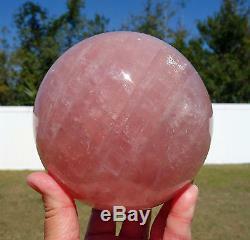 It is a large, gemmy, super pink, gorgeous sphere! Rose quartz is the stone of love. 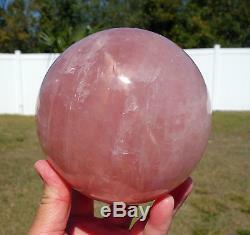 Star Quartz spheres remind us that our love is ever evolving! 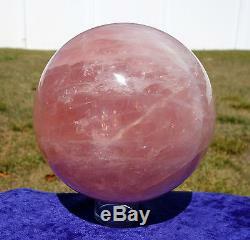 Extraordinarily GEMMY Translucent Luscious Juicy PINK and the Star beautifully floats across the sphere in natural light! So hard to find in this big size! STAR ROSE QUARTZ 6 ray Vivid Star of Light! The incredible star is super vivid when placed in the sunlight, and it just dances completely on top of and around this amazing sphere in true delight! A little elusive of the camera lens, but definitely not shy in person! We were completely amazed at the holographic light show this beauty delights in putting on for us! Gorgeous & just shimmery rose quartz at its' very best! WOW this amazing special beauty is loaded with wonderful energy for you! Just in to our store from Madagascar, where the very best rose quartz is from! It's a Quadruple WOW on this amazing sphere! 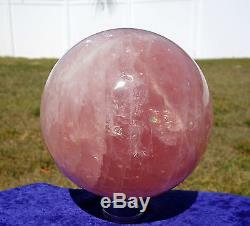 This sphere totally takes our breath away, what an incredible crystal sphere!! Here and now, get it while you can if it's calling you!! We are pleased and honored to have it in our store and to be able to offer it to you here & now! Not often do they come along so incredibly pure and beautiful, glowing, wonderfully energized and with such beauty and super gemmy, so very pristine, like this one has! If you think the pictures look good, just wait until you see it in person, the photos don't do it true justice! It is an absolute sizzler! No camera can possibly capture the true amazing incredible beauty as it should with this incredible star rose quartz crystal sphere! It is MUCH nicer than the photos allow us to show! See all of the photos for more details! You will be delighted that you did! So bright, so full of energy & rainbows! Shimmers in the natural light, and the holographic 6 ray Star of light comes out in the rose quartz so intense it will just blow you away! 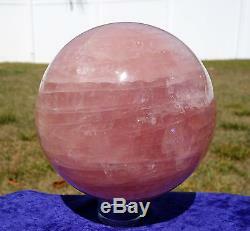 So very gemmy pink, has great ultra GEMMY shine, and is perfectly polished and is the very ultimate superior quality! 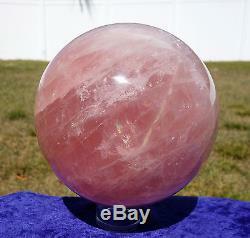 If you are looking for an amazing Big Star Rose Quartz , beautiful deep pink, then here it is! 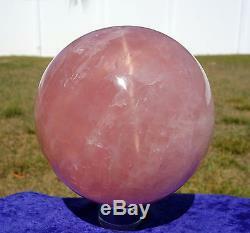 Metaphysically, Rose quartz is the stone of unconditional love. And this sphere has plenty of it! Good for release of stress, and healing the heart of it's emotional wounds. It purifies and assists in opening the Heart chakra, embraces warmth, forgiveness, compassion, and love. It is excellent for use in traumas or times of crisis, bringing with it a tranquility and peace within. Special healing crystal sphere you won't want to miss or be without! The item pictured is the exact item you will receive. Please note that any acrylic display stands shown in any of the photos are not included with the item. We welcome all international customers! We do not mark merchandise values below value or mark items as "gifts" - US and International government regulations prohibit such behavior. Our QUALITY SAYS IT BEST! We feel our crystals are the best available anywhere. As we go that extra mile & personally hand select each and every one of our crystals directly. From our importers for their Premium quality, great energy, one of a kind design, ultimate color variations & much more. We pride ourselves in bringing YOU, the VERY BEST! All of our crystals & stones are natural and have formed over millions of years. Because they are natural, each piece may have inclusions, natural lines or indentations. This is normal and part of the natural material. All photos are taken in natural light. We take extra special care in packing your items for safe arrival. Sign up for our store newsletter! This will ensure that you will receive our weekly newsletter so you can see all of our new arrivals! Thank you very much for visiting & enjoy! Have a super fantastic day! Come back and visit us again soon! 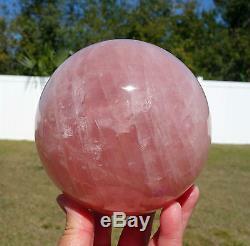 The item "STAR ROSE QUARTZ Crystal Sphere Ball Madagascar Luscious Natural Gem PINK Color" is in sale since Thursday, June 15, 2017. This item is in the category "Collectibles\Rocks, Fossils & Minerals\Crystals & Mineral Specimens\Display Specimens". The seller is "treasuresoflightcrystals" and is located in Deltona, Florida. This item can be shipped worldwide.